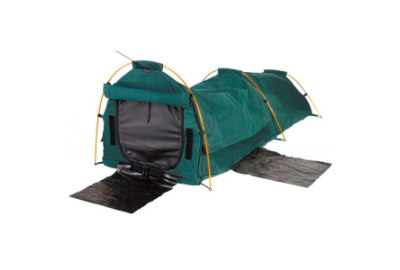 The Coolabah is a super deluxe dome, making it a perfect swag for camping in all conditions. The Coolabah has a unique front entry, with sturdy front and middle support poles. The velcro top comes back, for great ventilation and easy entry. The Coolabah is a very versatile swag. Canvas peg bag with 2 ropes and 6 pegs.